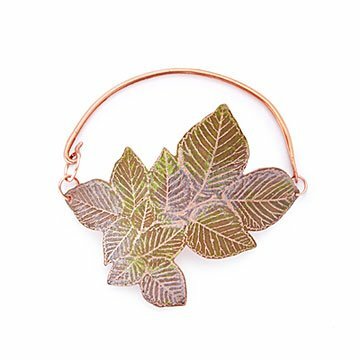 Sarah Daigneault infuses her copper cuff's lifelike birch leaves with nature’s effortless elegance. Sarah Daigneault infuses her copper cuff's lifelike birch leaves with nature's effortless elegance. Beginning with a sculptural approach, she first engraves details like leaf veins onto thin copper sheets with an acid etch process, then hand-saws and sands each cluster. Switching to her painterly skills, Sarah highlights the leaves with three colors of enamel glaze: neon yellow, shell pink, and turquoise. The resulting green nearly glows, mimicking the ever-changing hue of real leaves in natural light. A final layer of jewelry lacquer preserves both shine and color. The first tree to grow back after a fire or clearing, birch has symbolized beginnings and renewal since the last Ice Age, when the graceful white trees with the fluttering leaves reforested where glaciers had receded. Wearing Sarah's lightweight wrist wreath is a constant reminder of nature's potent beauty, which inhabits all life—including ours. Handmade in Pennsylvania. Gentle polishing cloth, do not expose to excess moisture for long periods of time. My daughter loves this bracelet. It fits perfectly on her tiny wrist. So different. The colors are so unique and different.